Oh Kanye, your talent is completely eclipsed by your antics. Kanye, a complete Twitter whore, has about half-a-million followers, but until this week refused to follow anyone. 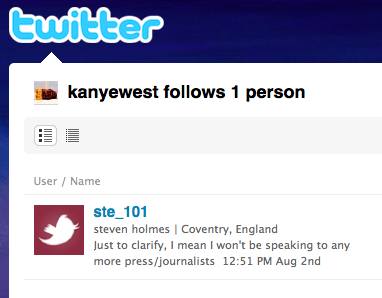 Humorously, Mr. West decided to follow some unknown college kid from the United Kingdom named Steven Holmes. Upon being followed by Kanye, Holmes was promptly followed by about 3,000 new people. He was also flooded with media inquiries, because they had to investigate Kanye West’s Twitter soul-mate… I guess they got bored reading the 77,000 leaked documents about the Afghan War. Kanye’s the man! The kid can live with it.